At the same time, we were seeing lots of birds, or rather, hearing them. The clouds wash out the colors, making everything up in the trees appear black and white. For quite awhile, walking along the gravel road leading into Rogers Refuge below the Institute Woods, there wasn't much lifting of binoculars. Rather, a rapt attention to calls emanating from the trees above. "Northern parula! ", someone would say suddenly. "Yellow throat"! "There's a Maggie," which I took to mean Magnolia warbler. Not having a memory for what in music might be called the "upper partials" of the bird world--the songs of less common birds like warblers--I contented myself with recognizing the sputter of a red-bellied woodpecker. Mixed with the staccato calls of the birders--"Pine warbler", "chestnut-sided"--were two overarching narratives running in contrary motion. One was of lost abundance. Bird numbers are down. What we see now pales in comparison to the 1960's and 70's. Those little green inchworms, so important to converting energy from the oak trees into energy for the warblers' northward migration, are now rarely seen, for reasons unclear. I suggested that the canopy is much higher now than it was forty years ago, so they may simply be out of sight, but hard to say. The other narrative, more cheering, came from Winnie and Fred Spar, who lead the Friends of Rogers Refuge group. They speak of the resurgence in the shrub layer in the forest, which in turn has provided cover and nesting sites for ovenbirds and other species that have become much more abundant in the refuge. For the first time in 25 years, warbling vireo nests have been sighted there. And it's hard to be too glum when a chestnut-sided warbler is saying "Please, please, please to meet'cha". (check out bird mnemonics at this link). The Friends group, of which I'm a part, can point to some initiatives that may be making a difference. Some water from the StonyBrook is getting pumped into the lower marsh this year to improve habitat. There's an ongoing battle to keep Phragmitis from taking over the upper marsh, and new birdhouses have been installed. But the biggest factor, less controversial than it used to be, is the hunting and professional sharp shooting that has brought the deer population more into ecological balance. Not many years back, the native spicebush that birds need in the understory had been decimated by the deer. Now it thrives. People, in effect, through community policy, have taken responsibility for filling the ecological void left when the natural predators of deer were driven from the land. It's a story of how, even as widespread habitat loss and rapidly changing climate work against the birds, people can contribute to restoring balance and diversity. Frogs are in even more rapid decline around the world, making this sighting of tadpoles particularly welcome. I found the plants to be a lot easier to see than the birds. They stay in one place, and don't fly off when you approach. Very convenient, though it doesn't always make identification a snap. This small tree, discovered while I was doing an ecological assessment and stewardship plan for the refuge in 2008, still eludes attempts to give it a name. Clearly related to cherries, it grows here and seemingly nowhere else in Princeton. Just across the road was another unusual tree, a Golden Larch, whose scientific name, Pseudolarix, is latin for fake larch. Having two unusual species together suggests that the location was either a home site a long time ago, or was otherwise significant enough to be planted. The golden larch's needles are longer than those typically found on a larch or our native tamarack. You can see how even this tree's deep green turns black against the white sky. Despite this, we got good looks at the vivid colors of a scarlet tanager, a baltimore oriole and an American redstart. We headed over to the bird blind, built by the Friends a few years ago, with windows reminiscent of an advent calendar. That's our Washington Crossing Audubon walk leader in front, Mark Witmer. and then headed back to the car, my mind glad for the new population of bird names flitting from one neuron to another: "pine warbler, Canada warbler, hairy woodpecker, chimney swift....." The rain held off, the birds held forth, and curiosity is a good thing to hold on to. Local nonprofits often have excellent speakers at their annual meetings. A brief update on the nonprofit's accomplishments over the past year is followed by the speaker, followed by refreshments. This Wednesday, at the Friends of Princeton Nursery Lands annual meeting, 7:30 to 9pm, you can hear Michael Catania, Executive Director of Duke Farms, speak on The Evolution of Duke Farms from a 2,750 acres private estate to a public learning center and model of sustainable agriculture, ecological restoration and stewardship. Michael gave some of us land stewards a tour of Duke Farms recently. Just 15 miles north of Princeton on Route 206, it's a big place with an enabling endowment and transformative plans, many of which are in the process of being realized. The meeting takes place in the Education Building at the Mapleton Preserve/D&R Canal State Park Headquarters, 145 Mapleton Road, Kingston. The event is open to all, and refreshments will be served. For further details, please call 609-683-0483. It seemed a straightforward mission, to put some extra native wildflowers from my backyard in the raingarden at the Senior Center on Harrison Street. The raingarden looked well enough in order, despite minimal attention last year. Rains and cool weather were conveniently imminent, improving the prospects for the transplants' survival. Just a matter of digging eight holes and dropping the new plants in. Half hour, tops. A closer look, though, revealed a scene more like an unruly classroom where schoolyard bullies were having their way with the meek and the mild. A tree of heaven was pushing up through the Virginia sweetspire shrubs, and that smooth oxeye (Heliopsis helianthoides), celebrated for all the color it added last year, was now sprouting everywhere, poised to dwarf and diminish the hapless competition. Sorrel, ground ivy and mock strawberry were creeping in from the lawn, needing to be pulled out in handfuls before they develop deeper roots. The Jerusalem artichokes I had planted (what was I thinking?) was asserting its underground imperialistic tendencies, making me and all nearby plants pay for the bright yellow blooms it contributed last year. What's a plant lover to do but start ripping out plants in an effort to restore balance? Two hours later, the overly aggressive species lay in a heap, tall plants were shifted to the back, and some semblance of balance was restored. They're white, and they're out and about, like this Deutzia. It works as a pruned hedge, but pruning makes it less likely to live up to its name, Deutzia gracilis. Not native, but not invasive. A Vanhoutte spirea (S. vanhouttei) cascading down next to a sidewalk. Not native but non-invasive. There are a couple native Spiraea species, one of which, Meadow Sweet (Spiraea alba), I found growing wild during a plant inventory of Rogers Refuge, deep in the marshy area. Sometimes suburban plantings can have more meaning if one can relate them to the wild relatives growing in more natural systems nearby. Out in the Princeton wilds, native Umbrella Magnolia (M. tripetala) grows in Institute Woods, with big leaves creating a striking effect in the understory. Down from Institute Woods, at Rogers Refuge, surrounding the smaller observation tower next to the marsh, grows bladdernut (Staphylea trifolia), a seldom seen native shrub that forms clones and later bears seeds in green "lanterns" reminiscent of Chinese lanterns. Up from Institute Woods, another native, hawthorn, planted in abundance at the Institute for Advanced Study. Autumn olive (Elaeagnus umbellata), with silver undersides to the leaves. It's a non-native that can invade fields. Princeton seems to have just a few here and there. A blast from the past: I was on a management committee years back for Penny's Bend in North Carolina, where we were managing the preserve to bring back the glorious prairies that once thrived on special "diabase" soils. Prescribed fire was a very important tool, but also hand removal of invasives that were competing with the rare native wildflowers. Our mission was to remove exotic invasive species like autumn olive, but the caretaker's wife, Hazel, loved making jam using autumn olive berries from an enormous specimen along the driveway. Occasionally at meetings, the topic of the autumn olive would come up, but we never had the heart to cut it down. Dame's Rocket is a non-native weed that comes in several colors--white, purple, pink. It can be mildly invasive, but seems to pick its spots. There's alot along the Mountain Lakes driveway near Mountain Ave, and also along West Drive on the way to Rogers Refuge. Garlic mustard has finished blooming, but here's a recent photo of a specimen that is apparently infected with a mosaic virus. This link describes how garlic mustard competes in the U.S. with native wildflowers like Trillium, while in its native Europe its harboring of the mosaic virus can affect commercial crops that are also in the mustard family. On the bright side, it's edible, though this particular specimen doesn't look too appetizing. This Persian lilac doesn't look very lilac. The small size of this kind of lilac makes it useful in landscaping. In the same front yard, looking very much like the Persian lilac, is a wildflower in the dogbane family, Amsonia. Related to milkweeds, there are several species native to the U.S., mostly south and west of NJ. This one looks like Arkansas Blue Star (Amsonia hubrichtii), with foliage that turns brilliant orange/yellow in the fall. Here it's doing fine in regular garden soil, but in the wild it's found, only very rarely, in marshes. and then spread some mulch over the cardboard and any uncovered grass. If the mulch is thick enough, even grass not covered by the cardboard will likely be killed, but the cardboard insures that no grass or even dandelions will be able to push up through it. Over time, the cardboard rots away, out of sight beneath the mulch. Newspaper, several layers thick, can be used in place of the cardboard, but it sometimes breaks down too quickly. Up the street is an unintentional but nonetheless excellent demonstration of mulch's power to kill grass organically, without sprays. Though often put out on the street for pickup, a pile of leaves is very useful for killing unwanted groundcovers and patches of weeds in the yard, usually along fencelines and in back corners. If one doesn't have enough leaves, using overlapping pieces of cardboard underneath gets more mileage out of the mulch available. Since the cardboard does all the work of stymieing growth from underneath, only a thin layer of mulch is needed overtop. Vines crawling over the ground, like English ivy, can be more stubborn, because any uncovered area will continue to feed energy to the portions covered with mulch. It's all about "unplugging" the unwanted plants from their energy source, namely the sun. This past January, visiting Mercer County's Howell Living History Farm to watch them collect pond ice, we also got a tour of the chicken coop. There was quite a crowd of chickens, but fresh straw was strewn all about. In the foreground is the watering can (heated to prevent freezing). Perhaps the cone-shaped "hat" over the water can prevents chickens from roosting on top of the can, and reflects some of the heat back down in winter. In back are all the nests. On the left in this second photo are two parallel boards that serve as roosts where the chickens pass the night in a trance-like state. The roost is also where they leave 90% of their droppings, so it's good to have a designated location for roosting that can be easily cleaned. I've also heard that chickens can sometimes squabble over which gets the highest roosting site, which may be why both of these long roosting boards are the same height. Though I'm sure there's more to keeping all these chickens happy, what often meets the eye at Howell Farm is an appealing simplicity. At a reception following a public talk by Ray Monk, the author of a biography of J. Robert Oppenheimer, there was considerable speculation about what kind of tree was growing across the field from Fuld Hall. This particular specimen has a growth form reminiscent of the Southern Magnolias (Magnolia grandiflora) found in the southeastern U.S., with dense foliage all the way down to the ground. Having been out to the Institute over the winter to research mathematician and visionary Oswald Veblen in their archives (my website about his extraordinary legacy and abandoned Herrontown Woods house is at VeblenHouse.org), I happened to know there was a sign buried deep in the tree's sprawling branches. Hard to know how much to read in to this Little Leaf Linden's (Tilia cordata) presence on the grounds. Might Elizabeth Veblen, who grew up in England and began the tradition of afternoon tea at the Institute, have wanted this European species available for making Linden tea? The director's residence on Olden Lane also has several suitably noble and towering Lindens growing near the house, though with the more normal growth form with leaves far out of reach. Veblen's vision for the Institute, which mingled with the visions of Abraham Flexner and the Bambergers, drew from both European academic institutions and his experience during World War I at an American military base, where a group of mathematicians developed a special intellectual camaraderie while improving ballistics calculations. much showier than the tupelos, which are about to burst forth with their barely noticeable green flowers. Tupelos (also called black gum, Nyssa sylvatica) save their show for the autumn, when their leaves turn a blazing red. One endearing feature of the Institute is how it has maintained its connection with its land's history as a working farm. Just behind the building where we heard about Oppenheimer's brilliant career in physics, a farmer may soon arrive to plant some corn. Interesting to note that Oppenheimer, though he grew up in New York City, grew deeply attached to the landscape of New Mexico when he visited a friend there, and later bought a ranch in the desert that served as a retreat for him and his colleagues and students while he was at Berkeley. When chosen to lead the Manhattan Project during World War II, Oppenheimer recommended locating it in Los Alamos, NM, in part because he believed the beautiful desert landscape would inspire the scientists. This connection between land, intellect and imagination was very much a part of Veblen's thinking a decade earlier, as he made the case early on for acquiring a large tract of land as part of the Institute for Advanced Study. Alamo happens to be another name for aspens, which have leaves much like the Linden's. The other day, walking the dog, I saw a neighbor inspecting the ground next to the curb, as if she'd dropped something and couldn't find it. Spurred by a mixture of curiosity and chivalry, I crossed over to ask what she was looking for. Turned out she was searching for a four leaf clover she had seen earlier in the day. To borrow from the song, whe was overlooking a four leaf clover that she had been looking over before. I looked down with my botany-honed eyes and spotted it within a few seconds. She plucked it, delighted, thanked me effusively, headed back to her house, and I went on my way. I don't know if that four leaf clover will confer any additional luck, but just in the finding it made both of us feel very lucky. This Wednesday in Kingston, you can hear the latest on the heroic efforts to save the red knot, the bird that flies each year from the southern tip of South America up to the arctic to breed. Along the way, it makes a crucial pit stop in New Jersey to refuel on rich, fatty eggs left on the beaches of the Delaware Bay by horseshoe crabs. Those beaches were swept away by Hurricane Sandy, but a last minute effort came from government and nonprofits to restore some of the beaches in time for the horseshoe crabs' arrival. I've added some links from news stories below, including news of one tagged red knot that's flown farther than the distance from earth to moon. Kingston Greenways Association Annual Meeting and the showing of a film Crash: A Tale of Two Species 7:30 pm Wednesday, May 22, 2013 at the Kingston Firehouse, 6 Heathcote Road, Kingston. After a very brief business meeting, Maria Grace, Education and Outreach Manager for Conserve Wildlife, will introduce this PBS Documentary that explores the relationship between the red knot and the horseshoe crab. A discussion and an opportunity for questions will follow. The meeting is free and open to all. Refreshments will be served. Here's some Moonbird math: 240,000 miles to the moon. 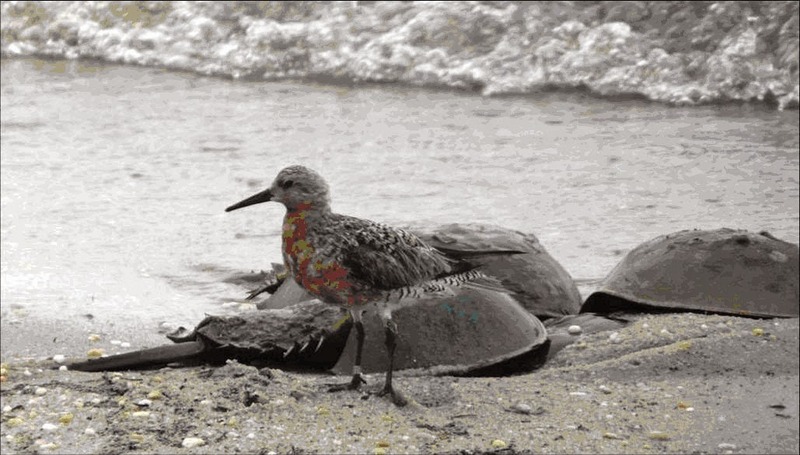 A red knot flies 18,600 miles round trip each year. The "Moonbird" red knot has been observed by birders since it was banded in 1995. That means it has flown more than 316,000 miles. May 18 and 19 (Saturday and Sunday), 8am: Two birdwalks to see/hear warblers and other birds at the Institute Woods and Rogers Refuge. More info at this link. Healthy Children, Healthy Planet, a fundraiser for the school garden program, today, Saturday, 10-2 at Riverside Elementary. More info here. Marquand Park Cleanup, Sunday, May 19, noon to 4pm. Good opportunity to get familiar with this park and arboretum, and meet the volunteers who help take care of it. A writeup on the park at this link. Note: Washington Crossing Audubon will be leading two bird walks here and in the adjoining Institute Woods this weekend, each starting at 8am. Follow the link for more info. As part of a "water in the landscape" course I taught at the Princeton Adult School, I led a walk around Princeton's premier wetland, tucked away at the end of a gravel road behind the Institute, at Rogers Refuge. The wetland is fed by periodic runoff from the Institute Woods, along with steady input from water pumped from the Stony Brook during the growing season. I think of it not as artificial but as "enhanced". Here's an update from Fred Spar, president of the Friends of Rogers Refuge, on the latest bird sightings: "we’ve had plenty of Wood Ducks on the water, some Mallards, Canada Geese and, briefly, a pair of Green-Winged Teal. And along the edges we’ve had a Bittern, a Sora, some Snipe, a Great Egret, lots of GBHs, and at least one Solitary Sandpiper. This weekend we also had a Little Blue Heron." is now taking to the trees next to the parking lot. It's an exotic ornamental vine that is proving invasive in some locations. that included a shagbark hickory (with beech trees to left and right in this photo). Some trees are so big in the Refuge/Institute Woods that their lower bark takes on a completely different pattern from the standard bark further up. Further on, a Jack in the Pulpit rising above a bed of jewelweeds and violets. A Mayapple with its shy flower shielded by the leaf. One thing I had forgotten to mention in the course description is that he final exam involves crossing a bridge suspended over the StonyBrook. Everyone passed with flying colors. The speckled bark of spicebush (Lindera benzoin) is a common sight now that the deer population is more in balance. This cluster of spicebush trunks did not exist ten years ago, when browsing pressure from deer was so intense that spicebushes had only one stem. All new shoots from the base would be eaten by the deer. The shrub survived only by having one stem too high for the deer to browse. You can see that one stem in this photo, now dead, due to the shrub having invested its energy in all the new shoots that finally got a chance to grow to mature height. Having a healthy shrub layer in the woods has greatly increased nesting by birds. We encountered evidence of the work of Clark Lennon and Eric Tazelaar, Friends of Princeton Open Space board members who have been keeping the trails clear. Virginia bluebells (Mertensia virginica), once surely common around Princeton, now are hard to find. This is the only one I know of. And its future, as well as its authenticity as a wild specimen, was brought into question when I noticed a patch of goutweed growing within a few feet of it. Goutweed is an aggressive spreader, introduced to the U.S. from Europe and Asia. Since it doesn't typically spread by seed, its presence suggests that the area had been planted at one time, perhaps as a garden for a dwelling long gone. This property, though open to the public, is owned by the American Water Company, which draws some high quality water from the wells there, does some light disinfection and sends it off to add to the water supplies of Princeton and West Windsor. Well water is tastier and much less expensive to treat than the Millstone/Raritan river water that comprises most of Princeton's tapwater. The "enhanced" wetland, in fact, began as an attempt by the water company to feed the aquifer with water pumped from the river. Instead of percolating into the aquifer, the water stayed on top. The birds came, followed by the birders, who then worked with the water company to maintain the auspicious arrangement. Here's one of my favorite spots--a sort of wetland savanna of stunted ash trees lightly shading a rich understory of sedges and ferns. Cattails, normally aggressive and domineering, "play well with others" here, probably due to the shady conditions. Tussock sedges make tussocks, with irises in the background. As the tussocks get higher year to year, they sometimes provide a dry enough spot for a tree to germinate and grow. A Question Mark demonstrates the interest butterflies take in bare dirt. Gotta love the latin name, Polygonia interrogationus. Butterflies don't seem the sort to be interrogating anyone. Viburnum dentatum, an uncommon shrub, grows well here with the steady soil moisture. We returned to the parking lot, where the students volunteered to help me cut the chocolate vine off the trees. Rogers Refuge is a special place, and a good example of how the right kind of human intervention can make a positive difference. Dandelion Free, or Pesticide Full?